Welcome to MyBinding video. 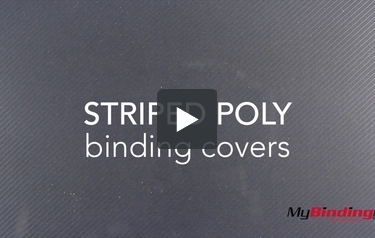 This is Striped Poly Binding Covers. These covers are transparent plastic with a diagonal stripes texture, giving you a little extra style with your clear cover. They come in sizes ranging from 5.5” x 8.5” up to 12” x 18”. You can choose to add a custom window to your covers or add rounded corners to your oversized coversheets. Even select from 8 punch patterns to receive your pages prepunched. These covers come in a 12 mil thickness, which holds up but bends easy. Because they are plastic, they happen to be waterproof and they add an extra level of protection, being tear proof. There are few colors of striped poly covers to choose from. For more demos, reviews and how-to’s, go to MyBinding.com.